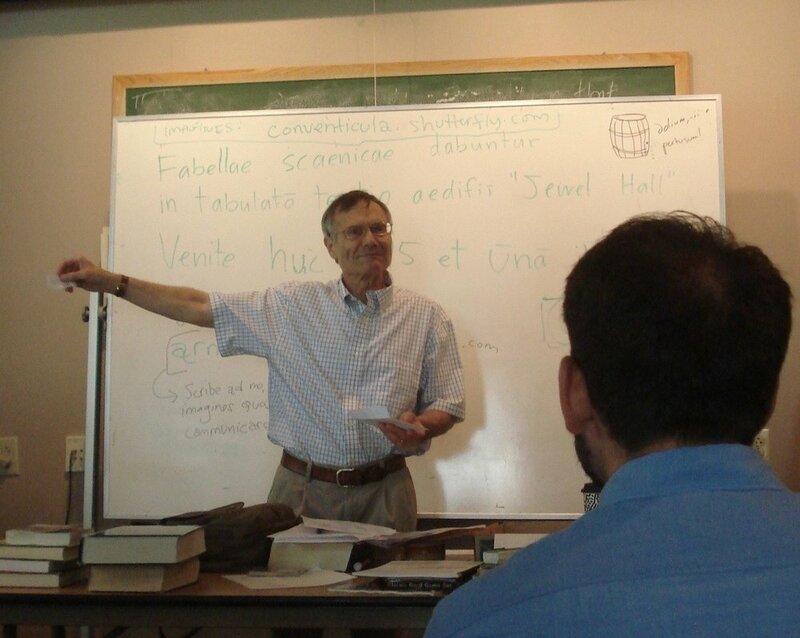 Conventiculum Latinum, Annual Convention for Spoken Latin to be held adjacent to the University of Kentucky campus in Lexington from 22 to 29 July 2019. These summer workshops have become internationally known for providing a stimulating occasion in which participants can live for an extended period of time in an all-Latin environment, speaking and hearing no language but Latin. Our Latin workshops are specifically designed for those who want to acclimatize themselves to the active use of Latin. We also invite participants who are already experienced in the active use of Latin. It is our intention that the conventiculum will provide such participants with a pleasant opportunity to practice or enhance their skills in spoken and written Latin, and meet like-minded others. Our conventicula are NOT designed for people who are still learning essential Latin grammar. All participants should be able to read unadapted Latin texts (even if they need to consult a dictionary fairly often), and should feel reasonably secure in their knowledge of basic morphology and syntax. However, previous experience in speaking Latin is not necessary. The purpose of our seminars is to add an active dimension to the experience of those who already possess a certain passive knowledge of Latin. These seminars should be especially valuable for any cultivator of the Latin language, who wishes to gain some ability to express her or himself ex-tempore in correct Latin on many different subjects. Not only teachers, who may wish to develop their ability use Latin actively and extempore so they can enliven the learning experience for students and augment whatever teaching strategies they prefer to employ, but anyone at all devoted to Latin, such as professors, graduate students, and those who read Latin for personal enrichment, can benefit from our seminars, which are exclusively aimed at helping those who take part to acquire a more instinctive command of the Latin language. Having acquired such a command of Latin a person can usually understand Latin writings more directly and easily, without being compelled so often to translate and to think in another language. Sessions will be aimed at developing ability in speaking Latin, understanding others speaking Latin, reading, understanding, and explaining Latin texts in Latin. There will also be some writing in Latin. Participants will be involved in intensive activity each day from morning until early evening (with breaks for lunch, etc., of course). Themes for discussion will involve books and literature, but discussions will also be devoted to questions pertaining to every-day life. May 1, 2019 is the deadline for receipt of entry fees and also, in the case of those who have opted for conference housing, the cost of lodging. However, we strongly urge those intending to take part to register much earlier than the deadline, since places in these events usually fill up quickly during the spring. In 2019 we will be able to accept no more than 60 participants. Please note that the entry fee and lodging fee, once paid, are not refundable. This, unfortunately, is an administrative necessity.. There are of course many hotels in Lexington where one can find comfortable and reasonable lodging, some of which are quite close to the University of Kentucky. However, we recommend that participants in the conventiculum stay in the housing facilities for University of Kentucky students, which are used for conference housing in the summer. These student residences are not only very close to the site of our sessions, they also offer lodging at fairly low cost. On the first day (22 July) there will be no regular sessions, but there will be a general reception with food and drink which will take place from 6:00 p.m. to about 9 or 10 p.m., which we strongly urge all participants to attend. In this initial reception not only Latin, but English or any other language may be used. After the reception, the use of vernacular languages will cease, and Latin will be the only language used in the conventiculum. Participants therefore should try to arrive in Lexington before 4:00 p.m. on the first day so they can get installed in their lodgings and find the site of the sessions before the reception actually begins. Applicants who wish make their own arrangements to stay in a hotel or other off-campus lodging will pay only the $150 entry fee (and no other price) in advance to the organizers of the conventiculum. Those who elect to stay in summer conference housing will pay both the $150 entry fee and the cost of lodging in advance to the organizers of the conventiculum. 1. A person who chooses to share a suite with another participant and to bring her/his own linens will pay $395 (which comprises the $150 entry fee plus $35 per night for lodging). Two participants who share a suite in conference housing will each have their own private bedroom, but will share a bathroom and the kitchen area. 2. A person who chooses to share a suite with another participant and to have linens supplied daily by the housing staff will pay $465 (which comprises the $150 entry fee plus $45 per night for lodging). 3. A person who chooses to have sole occupancy of a suite and to bring her/his own linens will pay $640 (which comprises the $150 entry fee plus $70 per night for lodging). 4. A person who chooses to have sole occupancy of a suite and to have linens supplied daily by the housing staff will pay $710 (which comprises the $150 entry fee plus $80 per night for lodging). Please note that the housing prices were quoted to us in the summer of 2018, and it is possible that the curators of student housing might make small changes in their prices without giving us notice. A person who intends to take part in the synodos, then remain in Lexington to be a part of the conventiculum Latinum also, may stay in student housing for the two days intervening between the two seminars. But it will be necessary for such a person to pay the cost of two extra days in student housing. Within walking distance from the site of our sessions are quite a few cafeterias, restaurants, cafes and fast-food outlets - both on and off campus. Well before the conventiculum we will send to all registered participants a list of these eating establishments (along with other materials pertaining to the campus and the conference).